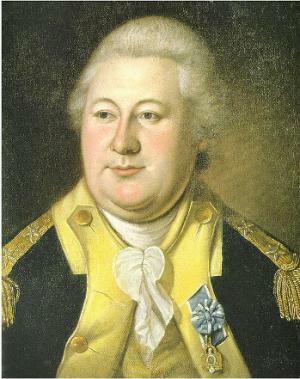 Henry Knox was born July 25, 1750 in Boston, Massachusetts. At 18 years old, Knox joined a local artillery company called The Train, beginning what would become a distinguished military career. Knox was an ardent patriot, supporting the work of the Sons of Liberty and participating in the Boston Tea Party. After the Battles of Lexington and Concord, Knox joined the militia army in the siege of Boston and directed canon fire at the Battle of Bunker Hill. General George Washington was impressed by Knox, and received a commission as colonel of the artillery regiment. Knox retrieved 60 tons of cannons from the capture Fort Ticonderoga and brought them to aid in the siege of Boston, helping secure American victory. With his natural knack for logistical operations, Knox played a key role in Washington&apos;s crossing of the Delaware River in 1776 before returning to Boston to improve artillery manufacturing and raise additional soldiers. Knox was present at the Battle of Brandywine and Battle of Germantown and joined the Army at Valley Forge where he set up the artillery park to defend the encampment site. The following year, Knox established a school for artillery and officer training in Bedminster, New Jersey. The school is considered the precursor of the United States Military Academy at West Point. In 1781, Knox&apos;s artillery were critical in the siege of Yorktown that led to the British surrender. Knox was promoted to major general in 1782 and was appointed commander of the fort at West Point, and with Washington&apos;s retirement in 1783, Knox became the senior officer of the army. In 1785, was appointed Secretary of War. He would continue in a diplomatic through the remaining 20 years of his life until died in 1806.